A right to challenge foreign data requests in the country of the affected data subject, and by that country's standards. In addition, as pointed out by the Electronic Frontiers Foundation in a comment on the second protocol, the proposal should not operate to lower existing protections such as Canada's prohibition on sharing digital identifiers without judicial authorization or the United States' requirement for probable cause-based production orders. Finally, the letter calls for a prohibition on data localization laws that are imposed without any privacy justification, for the primary objective of imposing often arbitrary and invasive surveillance obligations. For example, Russia has been taking increasingly aggressive steps in compelling global online platforms to host Russian data locally to facilitate invasive surveillance and censorship practices. A letter was sent today on behalf of coalition comprised of 83 leading organizations and experts from Australia, Canada, New Zealand, the United Kingdom and the United States to their respective governments in reaction to renewed state calls for measures that would effectively weaken encryption. 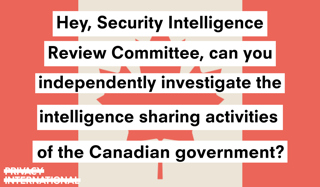 The letter responds to a ministerial meeting of the five governments' respective security officials hosted in Ottawa earlier this week, where possibilities for facilitating increased state access to encrypted data were discussed. The ministerial occurred under the auspices of the 'Five Eyes' - a surveillance partnership between intelligence agencies within the five countries, including Canada's Communications Security Establishment (CSE). It generated a joint Communique, which presented encryption as a serious barrier to public safety efforts and an impediment to state agencies wishing to access the content of some communications for investigative reasons. The coalition letter, which was organized by Access Now, CIPPIC, and researchers from Citizen Lab, called on the Five Eye governments to "respect the right to use and develop strong encryption" while urging broader public participation in future discussions such as the one that occurred earlier this week. Strong and uncompromised encryption has never been more important, as it protects our most sensitive data, our increasingly critical online interactions, even the integrity of our elections. In a 4-3 decision, the Supreme Court of Canada ruled in Douez v Facebook, Inc. 2017 SCC 33, that Facebook’s efforts in its terms of service to require Canadians to pursue grievances with Facebook in California courts instead of Canadian courts is unenforceable. The case involved a class action against Facebook alleging violations of BC's Privacy Act. The class action could not proceed, however, as Facebook argued that its terms of service require disputes to be resolved in California courts and under California law. Historically, the Supreme Court of Canada's jurisprudence favoured enforcement of these “forum selection clauses” on the rationale that holding sophisticated commercial parties to their jurisdictional choices advances the underlying principles that private international law seeks to achieve. CIPPIC has been awarded a grant from the Office of the Privacy Commissioner of Canada, through its Contributions Program, for a research project analyzing the activities of data brokers in Canada. The project, titled Back on the Data Trail, examines the evolution of the Canadian data broker industry over the past decade. The project picks up CIPPIC’s prior OPC-funded work in this field: in 2006, CIPPIC published a study of Canada’s data broker industry: On the Data Trail: How detailed information about you gets into the hands of organizations with whom you have no relationship. Over a decade later, and despite radical structural changes in Canada’s data broker industry, this report continues to be the leading analysis of the industry. Indeed, the Research Group of the Office of the Privacy Commissioner of Canada’s 2015 discussion paper on the industry, Data Brokers: A Look at the Canadian and American Landscape (September 2014), relied heavily on CIPPIC’s now-dated 2006 report. It is past time to update this important research. Google Policy Fellowships at Citizen Lab and CIPPIC Announced! Today marks the launch of the 2017 Google Policy Fellowship (Canada), which will host a Google Policy Fellow at each of Canada's two leading technology research and policy centres - CIPPIC and the Citizen Lab, University of Toronto. CIPPIC's Google Policy Fellow will join our Summer Internship Program and work closely with CIPPIC staff on a range of dynamic, cutting edge law & technology issues as we seek to further our public interest mandate. This includes helping to formulate strategy, conducting research and analysis, and drafting submissions to various levels of court, political and legislative venues, and regulatory bodies. Substantively, CIPPIC advocacy covers a diverse range of digital rights/policy issues, including copyright, privacy/electronic surveillance, telecommunications regulation/net neutrality, online consumer protection, online speech, access to knowledge and more general Internet governance concerns. CIPPIC is strongly committed to a diverse environment, and in particular encourages applications from racialized persons / persons of colour, women, Indigenous / Aboriginal People of North America, persons with disabilities, LGBTQ persons, and others who will enrich our discourse by ensuring it is the product of a diversity of perspectives. The policy fellow will also participate in our Summer Speaker Series, which brings leading experts in Canadian law & technology fields in to discuss various pressing issues with our students in a closed environment. See past annual bulletins for a list of past speakers, as well as a description of some of our work. Applications are due Friday, April 28, 2017. The fellowship will run for 10 weeks this summer and is open to any law students or law graduate students, with specific times and dates to be coordinated with the host organization. Application details are available at: https://cippic.ca/jobs/google_policy_fellowship_canada_2017.